As I type this, I'm looking out my apartment window at the Hudson River, which is likely to rise up and flood portions of my neighborhood in the next 36 hours, pushed by 70 mph gusts of wind. Like many up and down the Atlantic Coast, I am turning to social media for news and support, and once again I am reminded how important social communications have become to daily life. Alert friends and family: The most simple and obvious use for social media is to let others know what is happening. A simple tweet or Facebook post is sufficient to let hundreds of concerned friends and family know you are in one piece. The American Red Cross has a Hurricane app you can download to your Android or iPhone, including features for alerting loved ones you are safe. The phone app also includes checklists for protecting yourself and your home, features to turn your phone into a flashlight or strobe light and methods for finding nearby shelters. The Red Cross also offers a way to register yourself as "safe and well" so that others can search and find your status. Ask for help: Of course, if you are not safe and in need of assistance, social can also help there. When emergencies strike, phone lines can be compromised and emergency phone centers can become overloaded. So long as your phone is charged and mobile service is available, you can always tweet for help--many local emergency government offices have twitter handles, and you can always enlist your Twitter and Facebook friends for assistance. Following last year's Japanese earthquake, U.S. Ambassador John Roos used Twitter to communicate with Americans in Japan; upon learning of eighty people trapped in a hospital, he alerted authorities. "It was incredibly effective," he said of Twitter. Connect with your insurance company for updates, assistance and phone numbers. Accounts to follow include @usaa, @StateFarm and @allstate. Watch for #Hashtags: There is no such thing as a hashtag issuing authority, which means they tend to spring up organically. Already dozens of different localized and topical hashtags are in use, such as #sandypets, #sandynj, #nhsandy and #sandycenpa. In this year's Colorado wildfires, spontaneous hashtags appeared (such as #HighParkFire and #FlagstaffFire) to keep people informed about fire status and support needs. For other good tips, check out USAA's "Why You Need a Social Media Disaster Plan." If you have other social media tips to help prepare for Sandy, please share them. And if you have an interest in how I am faring in Jersey City, NJ, feel free to follow me at @augieray. Fifty years ago today, I was born. My birth was not accompanied by tweets or Facebook posts. No email announcements were sent; no photos uploaded to Flickr. Yet, a wide group of family and friends still found out within a matter of hours thanks to an archaic network of human nodes, copper wires, physical address books and contraptions with dials. Social media was not necessary for a small portion of the world to be introduced to Augie Ray in near real time. Nor was social media required for awkward comments to strain friendships. A family friend told my parents, "It's a shame he won't see his first birthday," a reference to the Cuban Missile Crisis into which I was born. I'm happy to report I survived to my first birthday--and 49 more since then. It will sound like an "old" thing to say, but I am constantly amazed at how much change I've witnessed during my lifetime. For the first decades of my life, the gold standard of interpersonal communication was the landline telephone--and my family (like many others) didn't even have its own dedicated line. One could pick up the phone and interupt a phone conversation between two strangers, and that would mean you'd need to wait your turn, not just from others within your own household but also the people with whom you shared the party line. One phone; one-half of a communication channel shared by the entire family. Music has changed a lot, also. As a child, portable music came in the form of a little plastic suitcase record player on which I endlessly played my parent's album, "Meet the Beatles!" When I got to college, some folks were just beginning to walk around plugged into Walkman portable cassette players, but I opted to go to the school library for my tunes. There, you could peruse a card catalog of LPs, ask at a window that one be played and then go to a carrel desk to hear your selection on headphones. There was no skipping, pause or reverse, but it was the first time I had a sense of the wonder of accessing unlimited content in real time. Around my 25th birthday, I discovered Bulletin Board Systems via a 2400 baud modem connected to a 40-foot cord that snaked through two rooms to the only phone jack in my home. The interface was kludgy but the sense of connecting to data and people in real time was heady stuff. Around age thirty, I joined Prodigy and soon became a community moderator on the Disney Fans Bulletin Board, an honor that included free access, thus avoiding the $200 monthly bills I was collecting. In 1994, Prodigy opened access to the Internet, and I quickly began experimenting with my own crude web sites. Three short years later I was abandoning my job managing a customer service division for a full-time career in the Web--my friends all thought I was crazy. It is easy to look back and see all that has changed, but it is also easy to overlook what has not: Basic human emotions, needs and relationships. What drove the advance of all this technology wasn't a desire to make money or to be powerful--it was the pure human desire to be more connected more closely with more people and information. There used to be nothing worse than calling someone's home and hearing the phone ring unanswered; years later, it was the annoyance of calling and having to leave a message that wouldn't be heard for hours or days. Today, we text, tweet, call, Skype, email, upload, share, communicate and connect anywhere and everywhere at any time. Some bemoan the lack of quiet, private time, but from where I'm sitting, this is a small price for the miracle of having the world constantly at your fingertips. There is a lot of our new digital, wireless and social world with which we still struggle, and the pace of change will continue to challenge. But for every problem and concern there seems many times more opportunities, benefits and joys. Today, as I think back to the party-line, rotary-phone, black-and-white, analog world of fifty years ago, I feel lucky for the many innovations I've experienced. I can only speculate at the wonders that await me on my 100th birthday. We social media bloggers love a good "crisis." It can be tough to come up with new things to write about month after month, so when a company stumbles in social media--a daily inevitability across the entire social web--bloggers pounce. But is the focus on "crises" and "disasters" good for our industry, and is all this attention really warranted? When one examines the actual business ramifications faced by those companies that have suffered the most visible social PR events in the short history of social media, there seems little evidence to justify the level of attention and alarm dedicated to the never-ending cycle of "social media crises." Certainly, when your company finds itself the target of hundreds (or even dozens) of irate and critical tweets and posts, it feels like a crisis, but are these events truly business crises? I recently explored this topic in a presentation I gave at the PR and Social Media Summit, and I suggested the term "social media crisis" is hyperbole--an exaggeration that marketing, PR and social media professionals leverage for more attention (and budget) but that inflates the short-term risks (while ignoring the actual long-term causes and threats). Look at the granddaddy of social media crises, United Breaks Guitars. You all know the story, of course--how could you not? Back in 2009, as social media was beginning to attract serious attention, this event became fodder for thousands of books, blog posts, articles and conference presentations. Given the attention this received, one would think United was fighting for its very life, but did "United Breaks Guitars" really damage United's business? While everyone seems to believe this infamous situation did harm to United, I have yet to find a single person who admits to altering their own travel habits because they heard Dave Carroll's sad tale. Did you, as a result of seeing the video, opt for a more expensive flight or less convenient itinerary in an effort to avoid United? Of course not, and neither did anyone else; in the six months following the release of the "United Breaks Guitars" video, the company's stock outperformed competitors Delta and US Airways by more than 150%. Did Progressive's "crisis" harm its business? We do not need to wonder, because the company's financial performance from this period can be found in Progressive's recent SEC filings. This event occurred in the middle of the company's last quarter, which ended September 30th. That quarter was the most profitable the company has had in over a year. Progressive's revenue was up 5.7% from the previous quarter and up 14% from the same quarter in 2011. The results were better than expected, lifting shares of Progressive's stock above the rest of its sector. There is no evidence this well-publicized social media event dented Progressive's financial results. And what about the 800-pound gorilla of social media crises--Bank of America's debit card fee debacle? This social media event made headlines worldwide thanks to a Change.org petition with 300,000 signatures, a Bank Transfer Day event with 57,000 likes and real-world protests at Bank of America headquarters. At first, there was convincing evidence that this social media crisis caused real damage to Bank of America's business. In the month following Bank of America's debit fee announcement, credit unions reported they gained 650,000 new customers, more than the 600,000 customers who joined credit unions during the entirety of 2010. The Credit Union National Association reported that deposits into those new savings accounts totaled $4.5 billion. A poll by Harris Interactive found that nearly 90 percent of credit union customers said they were extremely or very likely to stick with their current institution, while only 40 percent of BofA customers said the same. Notably, all the attention forced Bank of America to reverse its decision and rescind the new fees. Success--a social media crisis that demonstrably stung a company! Or did it? While some customers fled Bank of America, it was not enough to impact the company's overall performance. In fact, while credit unions reported picking up $4.5 billion in new deposits, Bank of America saw average deposit balances rise 500% more--an increase of nearly $25 billion in the same fiscal quarter as bank transfer day. And if any shareholders dumped their stock in the face of the vociferous social media protests, they regretted that decision; in the six months following Bank of America's disastrous fee announcement, shares of its stock rose 51% while the Dow Jones increased just 22%. In fact, after hearing how social media anger adversely affected the entire banking sector at the end of 2011, in the last twelve months, the KBW Bank Index has risen at more than twice the rate of the Dow Jones Index. We should stop using the term "Social Media Crisis": Merriam-Webster defines crisis as a crucial time with "the distinct possibility of a highly undesirable outcome." Social media "crises" are simply not resulting in "highly undesirable outcomes," at least as measured by important financial measures. Our use of the term "crisis" does not reflect well on our profession; it connotes panic when what we need to convey is assurance and capability. I have begun to change my language, using the word "event" instead of "crisis" or "disaster." An event is something we handle; a crisis is something we suffer. An event is something that can be planned for and prevented; a disaster is something we are powerless to foresee or affect. "Social Media PR Events" do matter but are not as acute as many make them out to be: I compare social media PR events to broken bones. A broken bone is a serious medical event--it is painful, requires immediate attention from a professional, and needs treatment to prevent more significant long-term problems--but no one in the medical field calls a broken bone a "crisis" (unless the patient is elderly or has an underlying condition). In the same way, our social media PR events are serious--they take us off message, weaken relationships, increase costs, distract leaders and may result in short-term loss of sales--but our attitude should be similar to how doctors react to broken bones: Professional, capable, experienced and calm. That is the approach our bosses want and expect of us--not calling a "code" and pulling out a crash cart every time we receive a couple angry tweets. Focus on the prevention, not just the cure: Certainly social media professionals must prepare their organizations for social media events--that is an important part of our job--but the exaggerated attention to crises may distract us from an even more important task--proactive prevention. Helping our organizations avoid the problems in the first place is not something we do just with tweets and posts; instead, we have to be consultants, helping peers understand the way the product and service experience, corporate decisions, employment policies, leadership, culture and mission can encourage or discourage advocacy, strong relationships and positive reputation. It is our reputation that matters, not the individual events: To be clear, I am not suggesting that reputation and social media does not matter; to the contrary, reputation is increasingly important, regardless of the "crises" experienced. It is possible for a company to suffer from crises and still succeed--look at Apple, which has faced considerable questions about its environmental commitment and supply chain labor policies but still continues to set records on Wall Street. It is also possible for a company to struggle despite avoiding social media events; Hewlett-Packard stock is down 44% in the past year, but it has not (to my knowledge) suffered a serious social media event in this period. (In fact, search for the term "Hewlett-Packard social media" and you will find a great deal of praise and positive press.) Of course, social media is but one of many factors that impact company performance and stock price, but the power of reputation continues to grow in the social era. As Bob Garfield and Doug Levy shared in Ad Age, the 2006 Edelman Trust Barometer demonstrated that "quality products and services" was the top response in identifying the standard of trust, but by 2010, "quality" had dropped to the third slot. "Transparent and honest practices" is the new number one, with 83% of respondents citing it. In short, it's not the crises that matter, it's your reputation. What do you think? Are we too obsessed with "the social media crisis"? Do you have some good examples of social media crises that have demonstrably and adversely affected company performance? Your input is appreciated! Perhaps I've been a blogger for too long now (four and a half years and 416 posts between this blog and my blog on Forrester.com). The social media news may change day to day, but I find myself wanting to repeat former blog posts to address the issues we continue to see repeated. KitchenAid is handling this unpleasant event well. And, as could be expected, this situation has launched a thousands blog posts offering advice to brands on how to avoid this blunder. Rather than offer my own new take, I am going to refer you back to the advice I shared in May 2011. This was when I came close to being one of those cautionary tales; I posted a personal status update on my employer's Facebook profile. Have a personal filter: The fact you are responsible for a company's social media profile doesn't mean everything you say personally has to reflect the brand's personality, but you must consider the implications of your posts. First, once you are officially associated with a brand, anything you say in your Twitter or other social media streams can reflect upon your employer. Plus, there's always the chance you pull a KitchenAid (or an Augie) and mix your personal thoughts into the company's channel. Keep them separated: As The Offspring said, you gotta keep 'em separated--your personal and professional social media tools, that is. For Twitter management, it is too easy to set up both your personal and professional accounts in a single Twitter client such as HootSuite. Doing so is a recipe for danger. Use different Twitter clients for different purposes, and you'll greatly reduce the risk. Someone at KitchenAid made a career-altering mistake. Do not let this happen to you. Consider whether the content you post is the sort of thing with which you (and your employer) wish to be associated, and use different tools for business and personal posting to avoid making a silly but painful error. We are five weeks away from Election Day, and I intend to vote for Obama. Don't click away from the blog quite yet, because that is the last I will say about my political leanings. My point isn't to convince you of my political views but instead to encourage you to share your views, as well as listen to others' in the final five weeks before the election. I was inspired to write this blog post by a well-known social media professional who posted a politics-themed Someecards user card to Facebook. 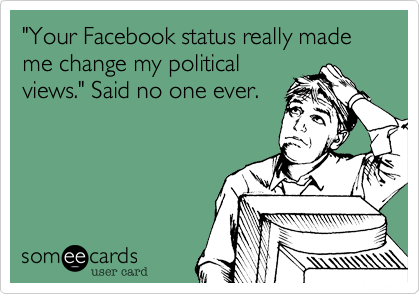 It read, "'Your Facebook status really made me change my political views," said no one ever." Soon many other people I respect (and that you know) were posting their agreement with the sentiment. I certainly understand the frustration people have about the campaign--it has already been a long election season, and between ads, news, phone calls and social media posts, it is hard to escape the din of politics. Still, it concerns me to see people who have national reputations for promoting the power of transparency and engagement suddenly giving the appearance of arguing the exact opposite. 36 percent of social networking site users said the sites are “very important” or “somewhat important” to them in keeping up with political news. Roughly one-fourth of the respondents said the sites are “very important” or “somewhat important” to them in recruiting people to get involved in political issues that matter to them, for debating or discussing political issues with others, and for finding other people who share their views about important political issues. Twenty-five percent of those surveyed said they have "become more active or involved in a political issue after discussing it or reading posts about it on a social networking site." Around one in six say they have "Changed views about a political issue after discussing it or reading posts about it on a social networking site." A majority may be cautious (or apathetic) about politics in social media, but in a year where a single percentage point may make the difference in the election, these survey results should encourage more political dialog among our social networks. Not only may doing so help you to change others' views, but you may also find yourself more willing to reconsider your own. Says Aaron Smith, a senior researcher at Pew, "people with greater exposure to (and interest in) political chatter on online social networks are more likely to change their mind or take action as a result (regardless of who that chatter comes from)." Of course, I am not recommending that brands start chatting about politics, but the idea that we should avoid politics within our personal networks seems contrary to the good of the country and the basic tenets of social media. We cannot very well gripe about the divisiveness in Washington and then bring that same contentiousness to our interactions with our own friends. If we want to see more political collaboration and dialog between Democrats and Republicans, we ought to start with more collaboration and dialog within our social networks. There are risks to talking politics in social media--Pew found that 18 percent of social network users have blocked, hidden, or unfriended someone due to political posts--but this shouldn't cause us to question if we engage but how we do so. The fact that Godwin’s Law has been part of Internet culture for over 20 years is a reminder of how easily a passionate online conversation can turn ugly. Godwin's Law states that as an online discussion grows longer, the probability of someone comparing another to a Nazi or Hitler grows, and that doing so automatically ends the conversation. Calling names, mocking candidates or supporters, sharing partial or incorrect facts, resorting to vulgarity, launching ad hominem attacks, ignoring the opinions of others and letting your passions overcome your logic and emotions are ways to not only lose friends but also undermine your own political arguments. Conversely, asking questions, inviting feedback, sticking to facts (as closely as possible), knowing when to back off and seeking middle ground can help foster healthy political dialog. Just keep in mind the goal isn't convince everyone but to understand everyone, and there is no shame in acknowledging that you and a friend have a fundamental difference of opinion. So, what do you think? Are you encouraged to engage more on political topics? Share your thoughts, and heck, let us know who you intend to vote for if you choose to comment below.